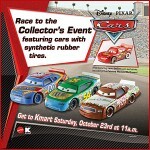 KMart and MattyCollector are teaming up for a new event celebrating Disney’s Cars. “Join Lightning McQueen, Mater, and the rest of the gang from Radiator Springs at the next Cars Collector Event happening Saturday, October 23rd at 11:00 AM at participating Kmart stores nationwide! Click here for the full list of locations. * Painted Masked Lightning McQueen (Chase) — 1 Limited quantities! * Race Tow Truck (Tow) — 1 First time with lenticular eyes! * #54 Faux Wheel Drive — 3 First time with synthetic rubber tires! * #74 Sidewall Shine — 2 First time with synthetic rubber tires! * #82 Shiny Wax — 2 First time with synthetic rubber tires! * #28 Nitroade — 2 First time with synthetic rubber tires! * #80 Gask-its — 3 First time with synthetic rubber tires! * #39 View Zeen — 2 First time with synthetic rubber tires! * #101 Tach-o-mint — 2 First time with synthetic rubber tires! * #36 Tank Coat — 2 First time with synthetic rubber tires!